"I Want to Go Home." And we added, from a few pages later, the poem “My Dear Conflicted Reader,” something of a belated proem. These sections can be found in the Copper Canyon Press edition of One Big Self on pages 3–8 and 14. One Big Self was published in 2003 with the subtitle “Prisoners of Louisiana” by Twin Palms Press with photographs by Deborah Luster, and then by Copper Canyon as One Big Self: An Investigation in 2007. 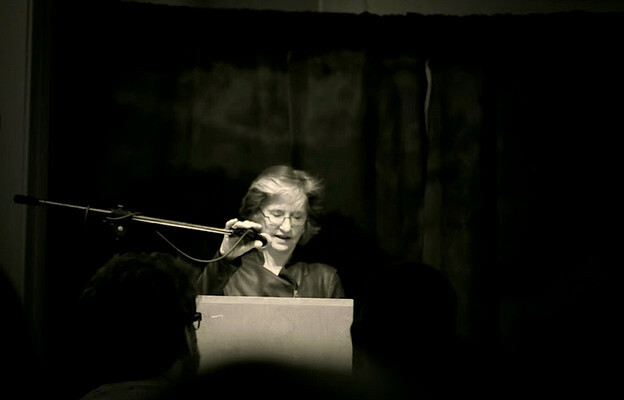 From the C. D. Wright page at PennSound we hear recordings of these sections of this verse investigation — first from Wright’s 2003 reading at the Key West Literary Seminar and then from her reading at the University of Chicago in March of 2005. C. D. Wright died suddenly and much, much too soon on January 12, 2016. PoemTalk sessions are of course mostly improvised and we had no idea how elegiac our discussion would be. We felt lucky to be able to focus on the ongoing life, as it were, of this brave and risky long poem (we discuss the risks at length), one that bears witness, as it turns out, in so many ways as to include its incessantly venturesome maker. Zach Carduner traveled with Al to Washington, DC and made the recording, and, as always, edited it later. We wish to thank Rob Casper for hosting us in the Poetry and Literature Center of the Library of Congress — indeed in the Poet Laureate’s room, not far from the ceremonial laureate’s desk (the PoemTalkers posed in front of said desk for the photo at right).